Mamadou Diop teaches drumming to students and professional drummers of all ages and skill levels. He teaches the importance of the drum in the African culture to the community as a mode of communication and in the daily life. 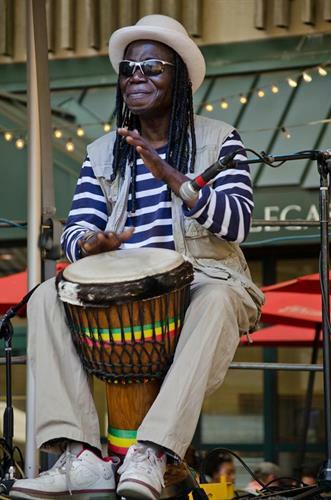 West african drumming is not just music, but an experience of the heart, mind, and spirit. It evokes self-discovery, spiritual renewal, joy for life, and a deep sense of community. A truly holistic healing approach, group drumming breaks down social barriers, promotes freedom of expression, non-verbal communication, unity and cooperation. Drumming awakens dormant emotions and unexplainable feelings of excitement, peace, and ecstacy. It decreases depression, anxiety, and stress, boosts immune system functioning, and benefits physical health.